According to the historian Movses Khorenatsi, the apostle Thaddeus came to Edessa where he healed the sick and baptized King Abgar. Khorenatsi writes that from Edessa, Thaddeus went to A rmenia where he preached and converted the Armenian king, Sanatrouk, and the king’s daughter, Sandoukht. When faced with the opposition of his governors, the king recanted his conversion. Sandoukht, however, refused to renounce the Christian faith. She was imprisoned and executed by order of her father, and thus became Armenia’s first martyr. Thaddeus was martyred at Artaz (in present day northern Iran). The Armenian monastery of St. Thaddeus is built on the apostle’s tomb. 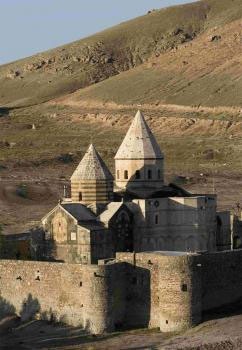 During the early 20th century the monastery was an important crossroads for the defense of the Armenian population of Van, Daron, and surrounding areas. A popular annual pilgrimage by Armenians from around the world takes place in July. During the four-day festival thousands gather in tents pitched on the monastery grounds, attend services, sing and dance in remembrance of St. Thaddeus, one of the two apostles who brought Christianity to Armenia. St. Thaddeus Monastery and the other famous Armenian monastery in northern Iran, St. Stephen on the banks of the Arax River, have undergone major renovation and restoration in recent years.